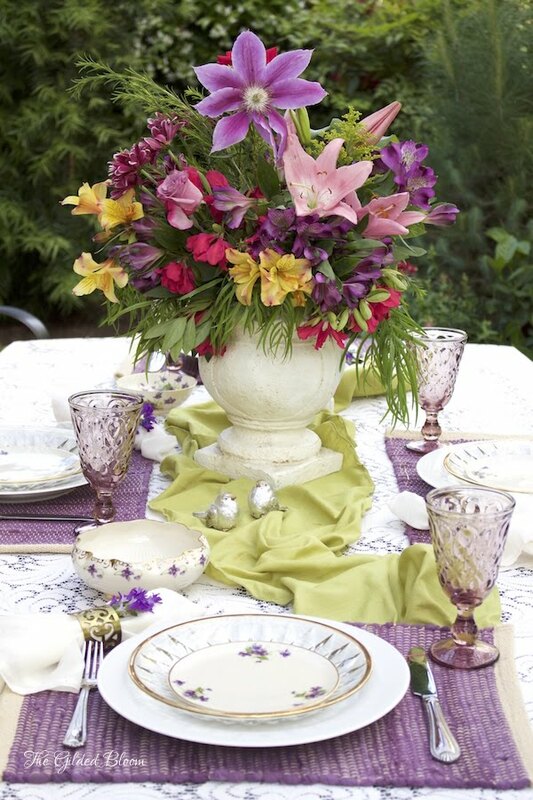 A centerpiece that features home grown flowers is simple to create and ties the table design to the surroundings. 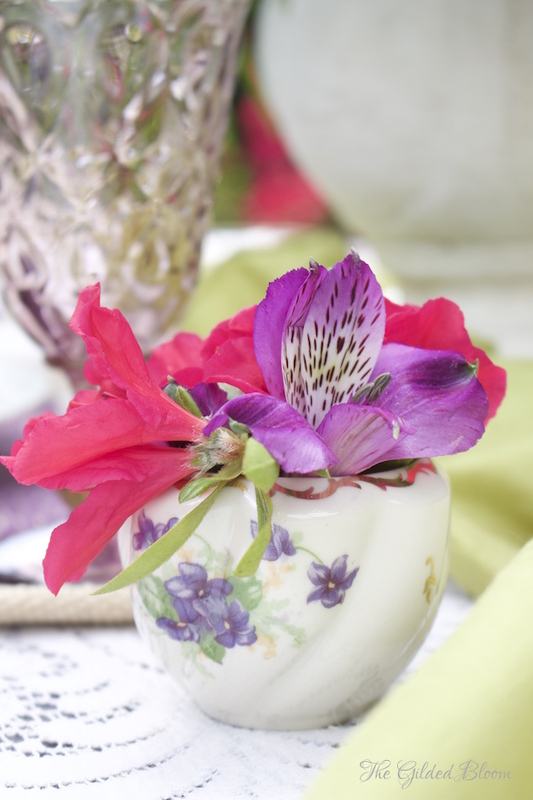 Here I used a plaster pedestal container and inserted a glass vase filled with water to hold the flowers. Snipping and clipping from the trees and bushes, I began to fill the vase with greenery and then worked in a market bouquet of lilies. 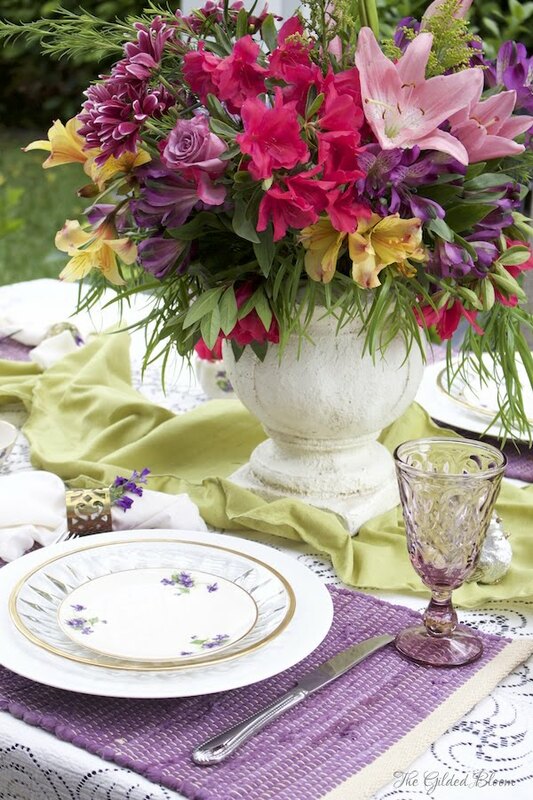 Flowers like azaleas, roses, trumpet vine and purple clematis were added to provide more color and texture. There is so much in bloom during May! I have been waiting for a proper occasion to use these lovely vintage china plates given to me by a dear friend. Painted with dainty purple violets, they complement the many shades of lavender in the garden. They are edged with gold so I paired them with gold rimmed glass salad plates and simple white dinner plates. 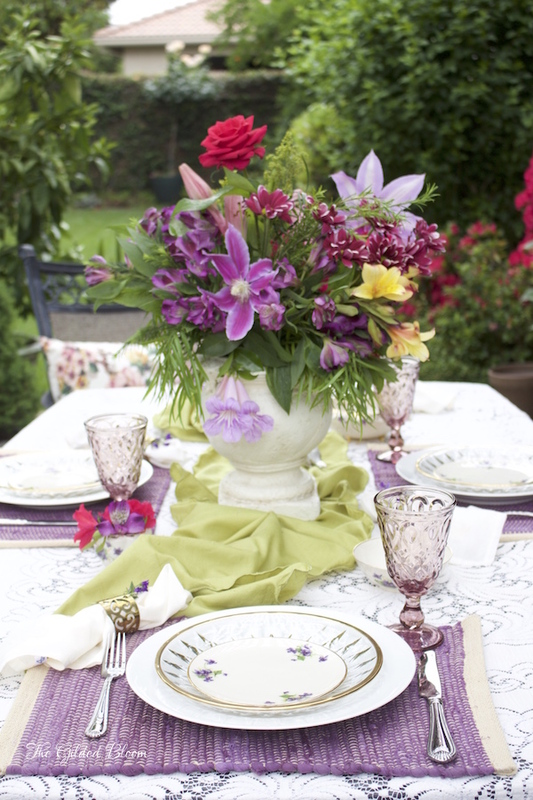 The gold napkin rings are accented with sprigs of purple campanula. 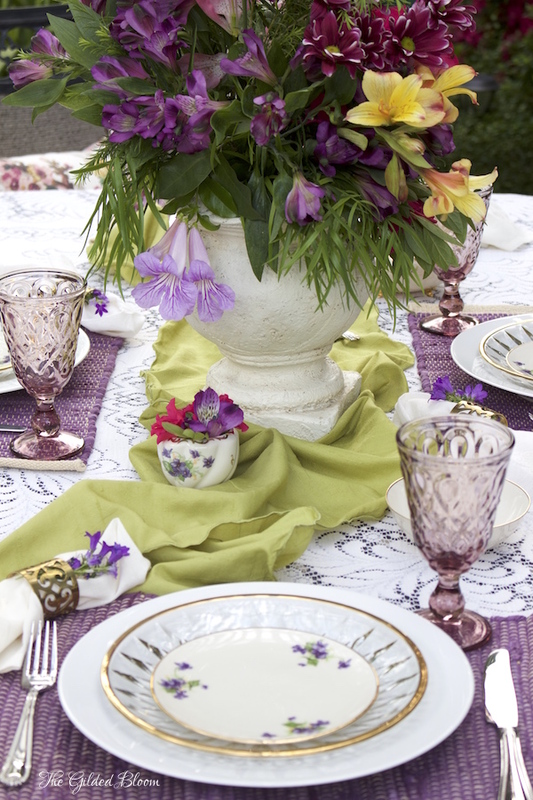 A vintage lace cloth covers the table and green silk fabric is used as a runner. 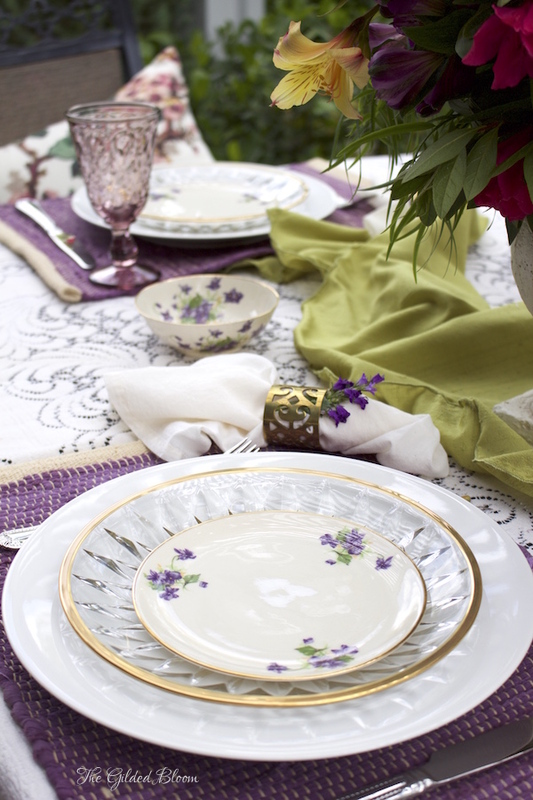 The placemats provide a pop of purple to match the plates and the amethyst glass goblets. 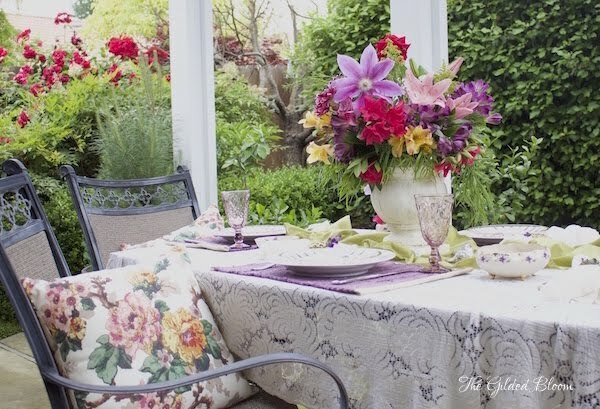 Pillows on the outdoor chairs make dining on the patio more comfortable and colorful. 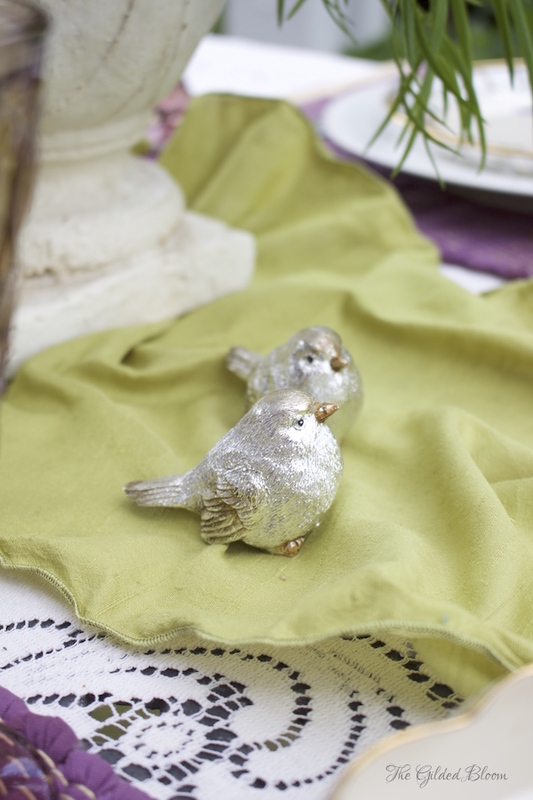 We have so many birds in the garden that these two on the table must feel quite at home! This vintage vase has flowers tucked in for an accent. The table is now ready for a relaxing outdoor get together! Beautiful amethyst spring table. Your flower arrangement is so pretty and lush and the amethyst goblets are exquisite.